CreatineTrec Creatrix 1350 - 120 kaps. Trec Creatrix 1350 - 120 kaps. Advanced connection certified form of creatine monohydrate - CREAPURE and ALA and vitamin B1. Use the power that comes from their synergistic action and enjoy fast increments muscle! TREC CREATRIX + ALA + Vit.B1 is a creatine product enhanced with alpha-lipoic acid (ALA) and thiamine (vit. B1). 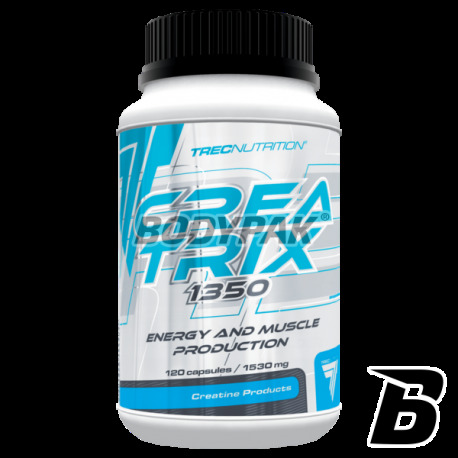 Thanks to its advanced formula, the product will be able to enjoy a significant improvement in muscle growth and strength in a short time after the start of supplementation. At the same time you do not have to worry about side effects, it is the most studied form of creatine on the market - no negative impact on the health of healthy people. 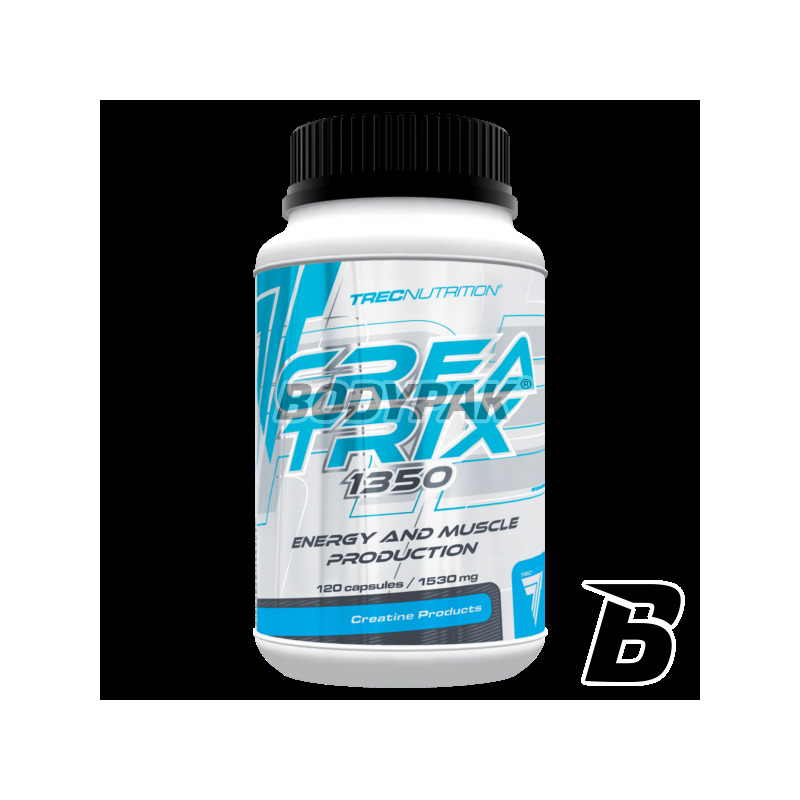 Used in the production of this excellent supplement creatine is certified CREAPURE, which is an additional guarantee of 100% pure composition! Creatine is a substance supporting strength and increasing muscle mass (anabolic effect). Indirectly, it also influences the regeneration of your body by improving nitrogen balance and delaying protein breakdown (anti-catabolic effect). Creatine has been enhanced with highest quality alpha-lipoic acid (ALA) and Vit. B1, which is involved in energy production and protect against adverse effects of oxidation (antioxidant function). ALA also stimulates insulin secretion, thus increasing the amino acids and creatine transport into the muscle cells. Delivery of creatine in combination with alpha-lipoic acid (ALA) and vit. B1 increases its resources in the body by up to 100%. This initiates a series of reactions that cause the cells absorb more water. Increased volume of the cell causes intracellular tension changes, which your body interprets as an anabolic signal that in turn triggers your muscles growth. With proper application can be within a few weeks to achieve 10-30% strength increase and gain 3 to 7 kg lean muscle mass. In order to achieve permanent results, combine creatine in one cycle with nutritional products containing: protein, and carbohydrate-protein, peptide l-glutamine, l-glutamine, HMB or amino acids. The recommended daily allowance is 4 capsules 2 times a day, drink preparation 300 ml of water. Serving 15 min. before the first meal, II serving 15 min. before the last meal. Składniki: Monohydrat Kreatyny – CREAPURE®, ALA (kwas alfa-liponowy), stearynian magnezu - substancja przeciwzbrylająca, witamina B1 (chlorowodorek tiaminy), żelatyna (A)/(B) celuloza - w zależności od oznaczeń partii produkcyjnej. Stosuje od kilku tygodni, działa, polecam! Incredibly strong product based on a formula that increases the production in the human body - nitric oxide (NO). The product has been recognized by many world-class athletes as the best in its category - see for yourself!